We brought in samples of these jackets and measured them and also tried them on our Fit Check mannequins Huey and Dewey. We put a 52 on Huey and a 56 on Dewey (typically they’d wear a 42/Med and 46/XL US size), and the sizes we chose give a snug/sport fit. Both look and fit great (click the “View Larger Images” link above to see). To help you choose a size based upon your chest and belly measurements, I’ve included the size chart below. It is based upon REVIT’s standard size chart and we think it is just about right. Also we’ve included a waist/belly measurement. If you have a larger belly, you’ll want to make sure you are buying a jacket that is large enough to accommodate you. If your belly is smaller than the max size indicated in the chart for the chest size you choose, just use the adjustment straps to customize the fit with no problem. A jacket like this looks great with the waist adjusters in a bit. Note: If you ever owned or tried on an Ignition 2 jacket, we find this new version runs just about 1/4 to 1/2 size bigger. 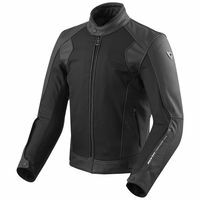 With the Ignition 2 jacket we cautioned that they ran just a bit small as compared to other, but since they’ve revised the sizing up just a touch, I think the overall sizes are commensurate with most European brands such as Alpinestars. The Ignition 3 jacket is now available and replaces the Ignition 2 jacket by REVIT. We put the Ignition 2 jacket on our site in October of 2012. What’s new here? Well, this new version looks a LOT like the old style, but the sizing has been “normalized” (see my sizing advice above) to make the fit more in line with other gear sold in the US. Also, The shoulder elbows armor is now CE Level 2 as standard. There are a couple minor styling changes with the new model. but those are the major differences/improvements. Being so similar to the previous model, some of the comments below are very similar to those I made in 2012. If you are a REVIT fan and/or even own the previous model, you’ll like this new style… it only got better. The Ignition 3 is a leather/mesh combo, which works great for warm climates. It really is the best combination of comfort and protection in hot weather. I have always liked the idea of leather as being the material between me and a moving surface of asphalt. Historically, leather has always been THE material of choice for maximum protection from road rash. The trouble with leather used to be how uncomfortably hot it was in the summer. But this mox of leather with lighter, more breathable mesh material is the complete solution. The material on the front and back of the torso is a tight weave, very abrasion resistant type of mesh. I can blow air right through, but the weave is tighter than most mesh jacket and it feels “tougher” to me and feels like it would be a notch above for crash protection. With this new Ignition 3 model, the mesh material is used on the back side of the jacket as well (on the previous version it was a solid textile). The jacket sleeve ends also have a nifty sleeve zipper to shoot some air up the arms. Take a look at our close-up photos of this feature. So the combo of the flow-thru torso (front and back) and sleeve end vents will take you through all but the hottest weather. In cooler weather, you can use one or both of the removable liners. First, there is a full sleeve waterproof/breathable/windproof liner. It will block air flow from your skin and also keep you dry in case of an unexpected rain. The use of the liner will keep you comfortable in cool to mild weather. And then finally, when it cools even further, you can add the vest type liner for added insulation of your torso. The zipper arrangement allows for you to use the vest/thermal liner without the full sleeve liner too, which in mild conditions would be great and would decrease the thickness of materials in the arms. Anyway, the choices are there and you’ll soon figure out what works best for you. New for 2018 with the “3” is Seeflex level 2 armor (level one on previous versions) in the shoulders and elbows. There is a pocket for the addition of optional CE-certified back protection (see sizing notes below and also the link to the back armor product page). The Seeflex is the same type energy absorbing armor as the popular D3O brand armor you see in many other brands. You can buy this armor with the same confidence since all are tested in Europe for performance under impact. It is a significant improvement over what was offered in the last version. Add a Back Protector: This jacket is made with a pocket to accept a Seesoft CE Level 2 Back Protector Insert type RV (RV refers to the shape). The back protectors are sold in sizes, so choose the back protector size that fits the jacket size you choose. RV size Size 03 fits jacket sizes 46-48, Size 04 fits 50-54, Size 05 fits 56-58 and size 06 fits 60.